Can we all just take a second to soak in all of this gorgeousness? The concept for this shoot was to set the scene for romance, while keeping everything simple yet intentional. That being said, minimal, and monochromatic was the goal. With event design by The Little Blue Knot and decor by The Market Collective, this wedding inspiration is so beautifully done and I'm just so thrilled to have the opportunity to share it with you. Thanks to C. Hope Photography for sending these shots our way! From the designer, "Sitting a top a red clay Georgian hill, she rests quietly abound with dreamy light and secrets. The church alone is truly stunning. And I was so inspired by the monochromatic palette that I knew less is more in the case of this location. I wanted to honor the beauty that was already there and not over work it." 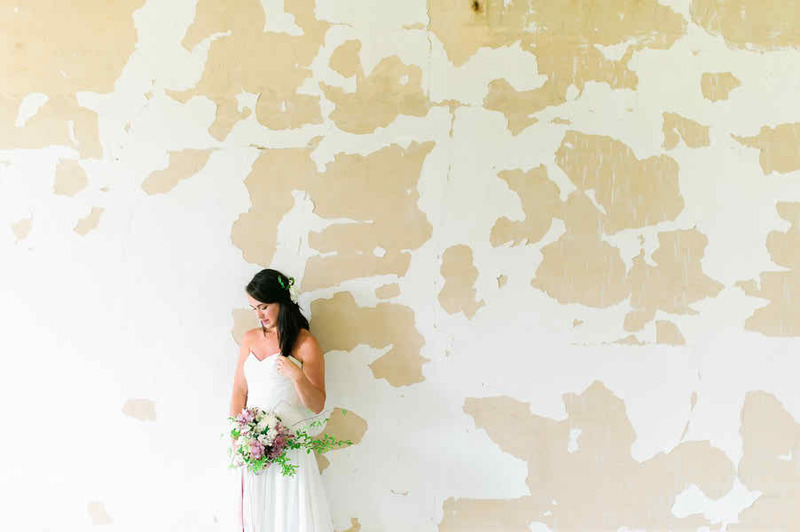 "On shoot day she certainly did not disappoint, we entered the church to begin set up and we were simply in awe of how the light was bouncing and dancing and rushing over the beautifully imperfectly perfect pealing walls. I wanted to pay an homage to the dogwood which blooms reflect some of the same colors in the walls of the church." "Often, brides play with color and you see the blush and pink and whites and purples, pops of yellow etc. But how chic is it when design knows when to let less be more!" "I added locally cut greenery and dogwood to the bouquet as well as champagne table. Only pulling from the model's natural lip color to accent her bouquet." "The cake and champagne table is full of local in season fresh fruit and well as blooms! Using seasonal fruit for pops of color on a table scape is one of my favorite things to do." "The colors are always so interesting and no two are every the same! For the table I brightened things up a bit but it doesn't feel forced because the color was incorporated by natural elements such as berries, peaches, and cake!" More from the designer, "Mt. Zion Presbyterian Church located in Sparta, Ga, is a true hidden gem. It has been abandoned but maintained for 60 years. Being born and raised only 30 miles from Sparta, I have always kept the church as my own personal sanctuary. Naturally, when I started design and styling as a career, I couldn't wait to share this special place within my work!" "My hope is to inspire brides and grooms to not over think it. To seek out the special, beautiful places that move them, to not forget that emotion should be evoked before they even add anything to the space at all and most importantly that truly jaw dropping venues are out there, affordable and waiting for you to find them. To look in unconventional place and be surprised by what you can find!" Huge hugs and high fives to all of the talented pros who came together to give this gorgeous scene life! No Comment to " Minimal + Organic Styled Shoot "